Words cannot describe how much I love pork belly in any form. Roast, Fried, Braised, Baked, you name it, I’ll eat it. Or maybe more accurately, I love biting into the succulent fat. It’s truly surprisingly I’m not obese by now. I guess that’s further supporting evidence that consuming animal fats isn’t the worst thing you can do to yourself. Note that I do have familial hypercholesterolaemia but my levels are actually pretty good ever since I change my diet habit to embrace real fats (synthetic fat is bad for you yo!). Anyways, as you might have noticed, my work schedule is completely inhuman lately. With average of 20 shows per month, I really don’t have much time off to do my own thing. Therefore, cooking has to be fast and simple, yet not losing the flavours. In my last post, I’ve included a photo of this dish I cooked along with the Preserved Veges dish which some of you have eyes sharp enough to pick it out. 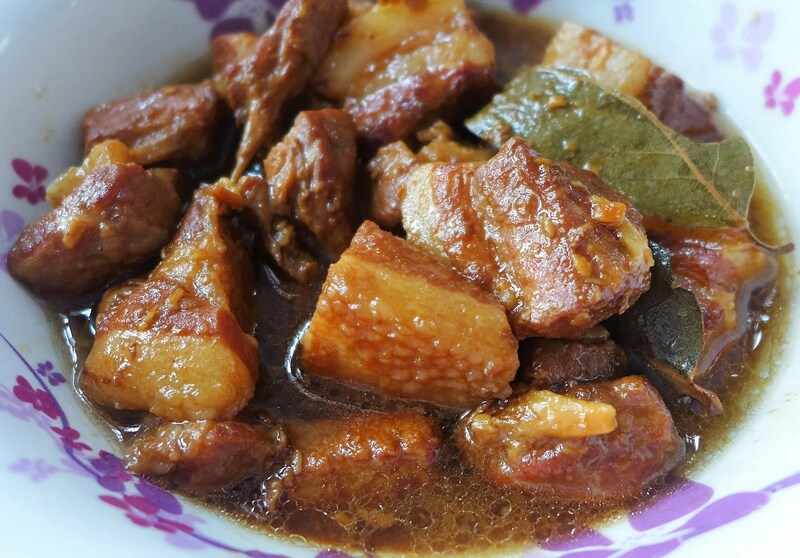 And today I’d like to share the recipe of this delicious Pork Belly Adobo. 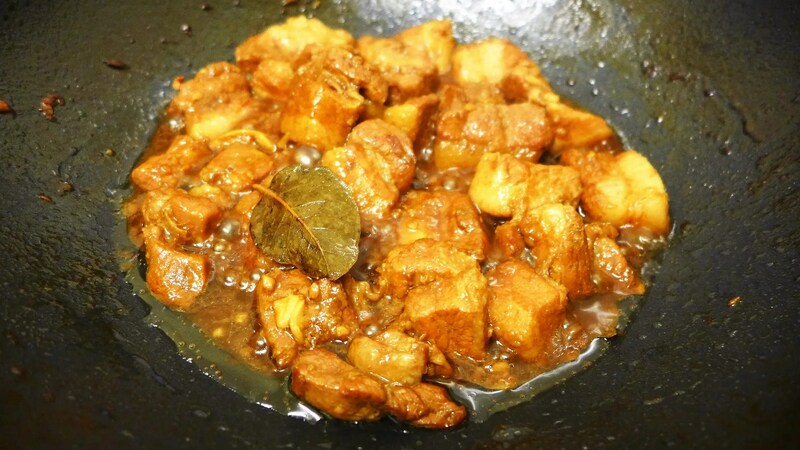 Adobo is pretty much a national dish of Philippines. It involves meat, seafood or vegetables cooked in soy sauce, vinegar and garlic. The name might be taken from the Spanish, but the cooking method is definitely native. Chicken is commonly used, so is Pork. It’s a no brainer which one I prefer. 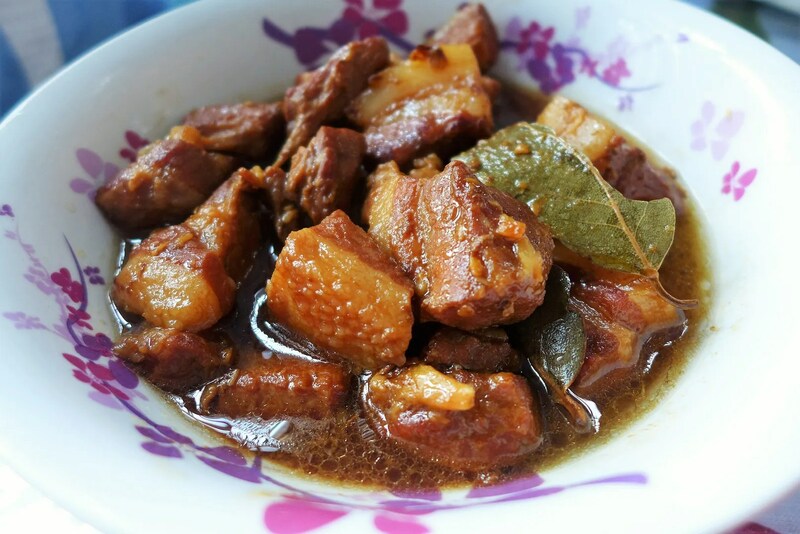 The process involves marinating the pork for at least an hour, and then just a simple braising process to allow the flavours to penetrate the meat until it’s nice and tender. Technically you won’t even need a recipe for this, but I shall break it down for you. Marinate the pork belly in half of the soy sauce, garlic for at least 1 hour. If you need to leave it in the fridge, make sure the pork comes back to room temperature before cooking. Heat a non-stick pan and add all the pork in to brown (there’s no need for oil since there’s plenty of fat in the pork already), then add the rest of the ingredients except vinegar (soy sauce, sugar, garlic, bay leaves, black peppercorns), stir to combine, bring to boil then turn down the heat to simmer. Add a bit of water and let the dish simmer for around 40 minutes, stirring occasionally. When the pork is starting to get tender, add vinegar and cook for further 20 minutes. The cooking liquid should be slightly thicker at this point. Turn off the heat and let it sit for around 15 for the flavours to further develop. Serve hot with rice. If you like your food spicy, you can actually add a chili padi or two during the cooking process. I prefer to just serve it with chili to tailor to individual liking. This method can be adapted to chicken as well, but the cooking time will be much shorter. Hope you get to try this one day! Nice, very very nice. I would love that very much! I’m sure you would! This is such comforting dish. This is nice! But why do you add the vinegar last and not together with the other ingredients? Sounds awesome. Thanks for sharing. Please pop over to my blog when you have a monent and see Melanie’s Chicken Curry with Peashat’s cooking on my end.